While every other region seems to be experiencing a thaw, it’s still mostly frozen here. My starts are happily enjoying their spots under the indoor lights and this weekend I’ll be starting another batch of plants like kale and Chinese broccoli. I happened upon a sale and purchased two additional plastic shelving units to hang a bunch of lights I had on hand. The extra space will give me plenty of room to repot tomatoes, peppers, and eggplants, and even start a few extras like flowers and herbs. So far, so good! Every gardener has run into problems at one point or another. Unfortunately, a lot of information out there doesn’t address the many things that could go wrong. Sometimes, even when you follow all the steps, your plants still die, pests still munch on all your greens, and seeds fail to germinate. I recently received a question that I thought would be worth answering here. The beans I put in a couple of weeks ago haven’t germinated and have gotten moldy. Are they going to germinate? Inadequate moisture. Seeds need moisture to germinate. That doesn’t mean you should drown your soil in water. Too much water can lead to rot. It’s too cold. 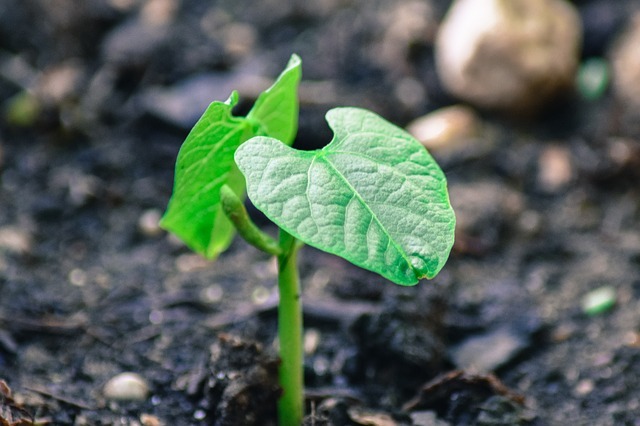 Beans will sprout in soil that’s at least 60 degrees Fahrenheit (about 15 degrees Celcius). The ideal range is between 70 and 80 degrees, though. If you’re growing in a basement where it tends to get chilly, consider adding heating mats underneath your pots or plant trays. Sprouting seeds near a window? In the daytime, when exposed to sunlight your plants may be nice and toasty, but on cloudy days or during the evenings, the temperatures likely dip considerably. It’s too hot. Certain seeds actually prefer cooler temperatures. Applying heat may be hindering the process. Too old. Properly preserved seeds can last a while in storage, but most folks simply fold down the packet and toss it wherever is convenient. If your seeds are over a year old and haven’t been stored in an airtight container, it’s possible they’re no longer viable. If you just purchased the seeds? It could be that you received a bad batch. You can try contacting the seed company to ask for a replacement. Disease. Did you notice a small seedling only to return a day later and find the baby plant shriveled and dead? Damping off occurs when seedlings are exposed to a fungal disease either through contaminated soil or unsanitary garden implements and accessories. Prevent this from happening by sanitizing your seed trays, pots, and tools every year. Purchase a sterile seed starting mix from a reputable company. Are you wondering what’s with all the mold? If you’re noticing a fuzzy white substance covering your freshly soil-filled pots or trays, it’s a sign that you’re overwatering your seedlings or that your growing area isn’t properly ventilated. Placing a fan in your growing space will help strengthen seedlings and keep air circulating. Watering from below may also help reduce the risk for mold growth. A specific tip for growing beans: Don’t bother starting them indoors. Wait until all chance of frost has passed and direct sow seeds outside. Why? Beans don’t respond well to the transplanting process. You’ll have healthier bean plants if you sow outdoors. I like to plants a few different bean varieties that mature at different times, so I always have a steady stream of beans to harvest for my dinner plate. Beans are pretty easy to grow, and they’re really fun to harvest. Finding ready-to-eat pods among the foliage is like a gardening treasure hunt!